Ancient Pagoda Architecture of Bagan. An evolution has taken place and the character of artistic creation in architecture and painting has been transformed. Over time some of this ancient Buddhist brick architecture broke and it was transferred from the strict tectonics and logic of the forms of the eleventh century to the prevalent dominance of the decorative elements in the 13th century as in the complex analysis of the individual monuments. 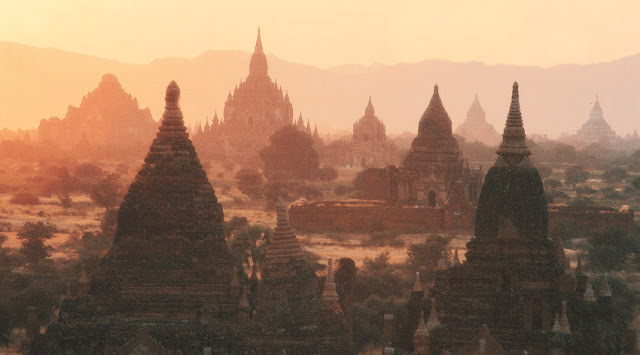 The indisputable stylistic unity of the Bagan monuments is not a standardization. On the contrary, they were of compelling manifolds. This is equally true of the architecture as well as the picturesque arrangement of the temples and their sculptural decoration. 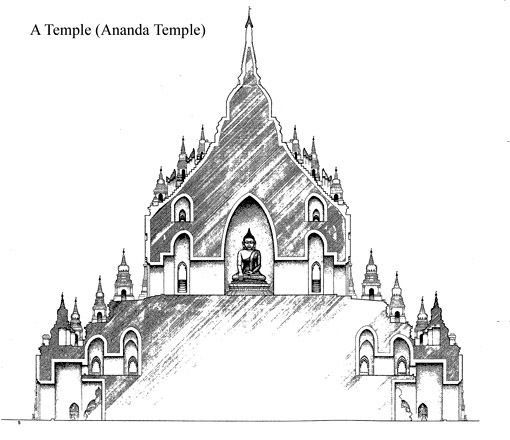 The festive canons of the general arrangement of the temples were combined with rich variations of their proportions and proportions as well as the forms of architectural decoration and the decoration with wall paintings and murals. 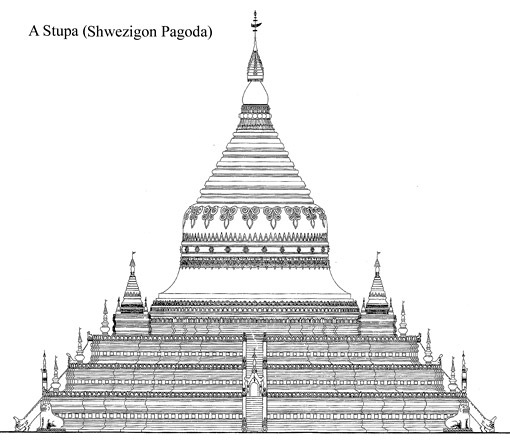 And it is almost unfathomable, in spite of the established Buddhist convention as show here in the stupa drawing. 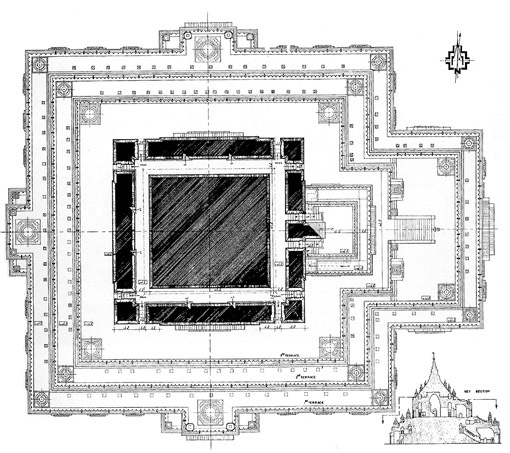 This clear system of succinct compositions is planted below and above of various ornaments, the lower frieze starting directly at the floor, imitating the older Bagan temples on the first stucco, while the upper consists of more than ten different ornament motifs. A showcase of Buddhist brick architecture. Finally Bagan became a showcase of Buddhist brick architecture and the bricks were phased out when concrete started to be the preferred building material. But there is still one major Problem and this are the the immense amounts of water the tropical monsoon storms empty over the Pagoda and temple city. However, not even nowadays they are not able to develop appropriate constructions or rather materials to stabilize the buildings which make it necessary to renovate every few years. The local construction technique has not been developed so far to isolate the wetness from the masonry by isolating what leads again and again to the wheel renovation of the black spots to fungal infection. As a whole, they form a very ornamental rich and formal ribbon. The plant ornament is also interwoven with figurative motifs. You can look at it for hours and discover ever new details, fascinated by the invention of the one-time artists, of their admirable mastery, with which they painted animals and fabulous beings and incorporated into floral patterns. The whole situation brings up the same questions as it was with the pyramids of Egypt how they were able to handle the architecture by not having the technical means of lifting and moving heavy items.